Donna is a California native and grew up in Piedmont. She studied and lived with a family in Vienna for her junior college year and graduated from the University of Denver. After college she became a Flight Attendant for World Airways during the Viet Nam war and flew worldwide. After being a stay-at-home Mom for several years, she ran her own automobile brokerage company for ten years serving personal needs as well as corporate needs such as Pacific Telesis. In the meantime, she volunteered several years for the Alzheimer Association answering calls on their help line working with people who didn’t know what to do or whom to contact with their loved ones’ personal issues. In 1994, she ans several other women formed a national networking group of home redesigners (design with existing furnishings in homes) ans several years later, became a certified instructor of redesign for people interested in starting their own redesign business. The course involved not only redesign, but business planning, marketing and accounting. She has contributed to two redesign books and one book on home staging. 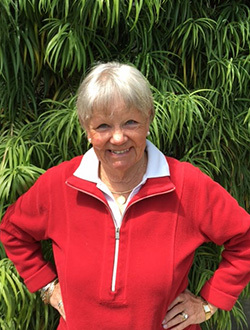 After moving to Rossmoor, she co-chaired a Boomer home tour and, as a result, the Boomers were able to donate over $21k to the Rossmoor Fund. She presently gives free classes to Rossmoor residents who want to design and advice for downsizing.